Issued February 17, 1998, to Namco Ltd. In 1995, Yoichi Hayashi of Namco Ltd. invented a variant of a technique called “Invade-a-Load” which was used in software for the Commodore 64 computer. Namco’s invention was for use with optical disc-based platforms such as the Sony PlayStation. The patent expired on November 27, 2015.Namco’s patent covered “auxiliary games” that a user can play while the main game is loading. Sony released the PlayStation in 1994. The console had advanced graphics for the time, which it could do by replacing the previous generation’s gaming cartridges with CD-ROMS. However, the PlayStation needed to initialize a game by loading the game data from the disc into the console’s memory. The loading process could take several minutes depending on the size of the game, and players would be forced to watch a load screen. Any gamer can tell you that load screens are very dull, especially compared to the instant gratification of cartridge games. The ‘632 Patent solves this problem by creating a technique for a player to play a smaller game during the load screen. Namco utilized the ‘632 Patent by allowing Ridge Racer players to play the classic game Galaxian during the load screens. It took no time for the console to load Galaxian, therefore, playing the game would not inhibit the console’s ability to load Ridge Racer. Namco made playing Galaxian more than just a distraction since Ridge Race would reward the player with in-game bonuses if he/she could beat Galaxian before the load finished. A recording medium, a method of loading games program code, and a games machine is provided. 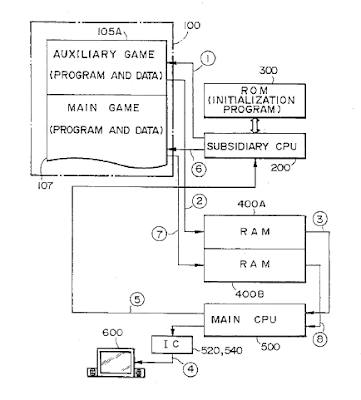 The recording medium has a program code relating to an auxiliary game and a program code relating to a main game. The size of the auxiliary game program code is small compared to the size of the main-game program code, and the relationship between the auxiliary game program code and the main-game program code is such that the auxiliary game program code is loaded first, before the main game program code. Unnecessary wastage of time can be prevented by first loading the smaller, auxiliary game program code into the games machine, before the main-game program code is loaded, then loading the main-game program code while the auxiliary game is running. computer readable main-game program code means for processing a main game, wherein a size of said auxiliary program code means is smaller compared to a size of said main-game program code means and wherein a relationship between said auxiliary program code means and said main-game program code means is such that said auxiliary program code means is always loaded first, before said main-game program code means.